In an enlargement of a pronucleus in the chromatin material appears as sparsely scattered opaque bodies, as may be expected of a haploid nucleus, in a medium dense nucleoplasm. The nuclear envelope of the pronucleus seems to be in very close contact with the nuclear envelope of the macronucleus as though pores might link and allow direct communication between the two nuclei. 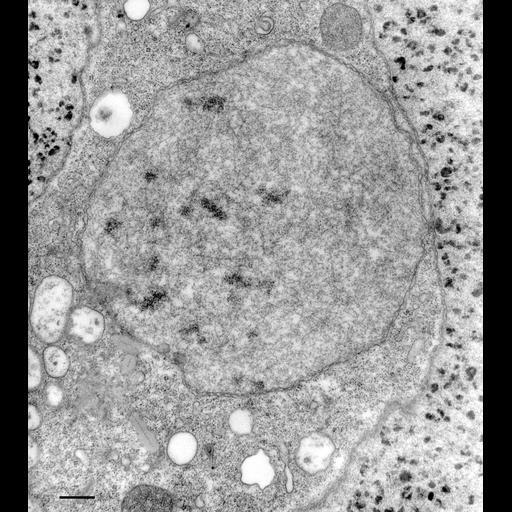 Remnants of microtubules are scattered in the nucleoplasm. TEM taken on 3/4/80 by R. Allen with Hitachi HU11A operating at 75kV. Neg. 10,250X. Bar = 0.5µm.